One of the mandates of the National Collaborating Centre for Healthy Public Policy (NCCHPP) is to inform Canadian public health practitioners about effective strategies for promoting the adoption of healthy public policies. Health Impact Assessment (HIA) currently represents one of the most structured practices available to public health actors. It is applied to policies developed by sectors other than that of health that can significantly affect health determinants. 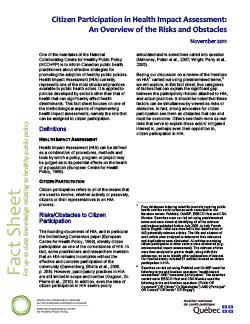 This fact sheet focuses on one of the methodological aspects of implementing health impact assessments, namely the role that can be assigned to citizen participation.